For Ronda Rousey, the current "G.O.A.T." in MMA is easy: Daniel Cormier. Cormier added the UFC heavyweight title to his collection when heknocked out Stipe Miocic this past Saturday night at UFC 226. "DC" is also the current UFC light heavyweight champion. 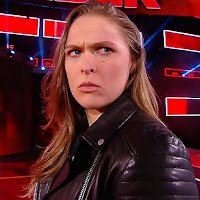 Rousey, in a quick interview with TMZ Sports in Las Vegas after being inducted into the UFC Hall of Fame during International Fight Week, declared Cormier the "best fighter" in the UFC today. The two are both former Olympians, having represented the United States in wrestling and judo. Rousey was also asked who would win the upcoming fight between Cormier and Brock Lesnar. Rousey said that she probably won't watch the fight because she's friends with both men, and wouldn't pick a winner. "I hate watching friends of mine fight, it's heart-wrenching," Rousey admitted. Rousey was also asked about a possible WWE Hall of Fame induction now that she's in the UFC Hall of Fame. Rousey noted that she'll need to put in a lot more work for that.